A map of The Great Maze, showing where the Subspacial Smashers and Bosses are. The Great Maze (大迷宮, Great Maze) is the 31st and final level of the Subspace Emissary in Super Smash Bros. Brawl. After many sections of the World of Trophies are sent to Subspace, Tabuu creates a large maze made of sections from most of the previously visited levels in the game. To complete this, the player must win a number of battles, against Subspacial clones of all the characters in the game (excluding Sonic, Jigglypuff, Toon Link, and Wolf), and against all of the bosses (except for Master Hand and Crazy Hand). The door leading to the final battle against Tabuu. The door when opened. Tabuu's wings can be seen inside. There is no specific order in which the player must beat all the enemies, and it is possible to play as any character that has been rescued so far. Save Points and Warp points are dispersed throughout the maze. These two types of checkpoints are indicated by the Smash Bros. emblem mounted on a trophy stand and look like a forest clearing with a Subspace rip in the fabric of the sky. Save Points restore the player's stock to 4 (6 in later runs) and damage to 0%, as well as letting the player re-select characters or fiddle with stickers. Warp Points are identical but also allow teleportation between other visited Warp Points, as well as serving as both entry and exit points to and from the maze itself. 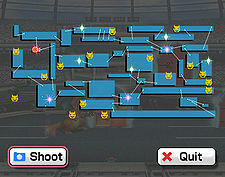 Pausing at any time displays a map of all visited rooms, as well as the player's current position inside a room and where doors and room-to-room links are. Once enough rooms have been visited to form a loop with the starting point, the map will also display all the locations of unbeaten characters and bosses with icons in the form of a monster head. 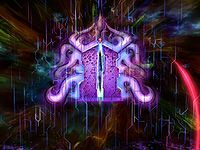 Once all battles are completed, a large purple door becomes accessible in the center of the maze, which leads to Tabuu's Residence. Upon winning this final battle, in-story the Great Maze is spread apart and all the levels and locations of the World of Trophies are returned to their normal state. The Isle of the Ancients, however, is not restored: the great number of Subspace Bombs going off in one place has taken it beyond repair. In-game, the Great Maze remains on the world map afterwards so that the player can reenter it for completion later, and the stages on the Isle of the Ancients are still playable. If no trophies are rescued in Subspace, the player still gets six characters to choose from in The Great Maze. Ness, Luigi, and Kirby are revived by the Brooches, King Dedede is revived by Luigi and Ness, Bowser is revived by King Dedede, and Sonic appears at the very end of the Great Maze. All other characters with the exception of Toon Link, Jigglypuff, and Wolf must be revived as trophies in Subspace. Some parts of The Great Maze are combinations of older stages, with many having slight modifications and different music from than the originals. This includes The Forest with the day-changing doors from The Lake and The Research Facility with the three-switch doors from the Subspace Bomb Factory. Some of these stages sport new areas, such as the elevator rooms in The Halberd and The Research Facility, the mountain entrance to The Battlefield Fortress, the icy floors in The Ruined Zoo, the triple switch doors in the Research Facility, and the day-changing doors section in The Forest. In addition, all three of the Halberd's playable sections appear in the Great Maze despite the Halberd being destroyed and never entering Subspace. Lastly, some of the areas are laid out in such a way that the player will go through a level in the opposite direction, such as the Ruined Zoo, the Wilds, and the Battlefield Fortress. And since the R.O.B. Squad was destroyed in the Isle of the Ancients, they do not appear as enemies in the Great Maze. The fights against each subspacial clone each take place on a unique stage. A gallery of these stages can be found here. Tabuu's Residence is the common fan name given to the stage on which the player fights Tabuu. It is very similar to Final Destination, consisting only of one similarly long and purple platform, though slightly longer and differently patterned (with a central design similar to that on Tabuu's wings); and with its own background visuals, somewhat reminiscent of the version of Final Destination in Super Smash Bros. Melee. Its music is titled Boss Battle Song 2. The stage can be accessed in other modes via hacking techniques. The Great Maze has many different music tracks in it, some of which only appear during the fights with the dark clones or the bosses. Of these, only Yoshi, Wario, Pit, Fox, Falco, Captain Falcon, Snake, Olimar, and R.O.B. 's false character battle themes are not from their respective universes. Flat Zone (Melee) - False Mr. Game & Watch, False R.O.B. Despite having only 4 stocks at a time available for the initial playthrough, 6 are available on all successive playthroughs. This is likely due to two reasons; the possibility that the player did not retrieve any trophies in Subspace Part I and II, leaving them with only 5 characters for the entirety of the Great Maze (Bowser, King Dedede, Kirby, Luigi, and Ness, with Sonic not appearing until the end) and that subsequent playthroughs do not allow for a refreshed stock post-cutscene before Tabuu. To form a loop back to Midair Stadium, at least 9 bosses/Subspacial clones must be defeated: Petey Piranha, Link, Diddy Kong, Samus, Ridley, Mario, Galleom, Lucas/Wario, and Lucario/Rayquaza. If a Sacrificial KO is performed on a false character in the Great Maze while the player is on their last stock and holding an item, a glitch will occur where the player will reappear in the area they were previously in, no music will be played, and after a few seconds, the screen fades into the Continue screen. A guide to the Great Maze. This page was last edited on September 11, 2018, at 14:16.